This Graham and Brown Checkered pattern via Design Public echoes the geometric shapes in the house without competing for attention. Available in white or black. (I also want the Vitra George Nelson Sunflower clock so bad). 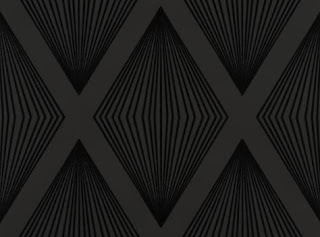 The black flock wallcovering from Romo Laurito in Ebony from the Grandis collection would certainly make a statement. Gorgeous but maybe a little too like a snowflake? 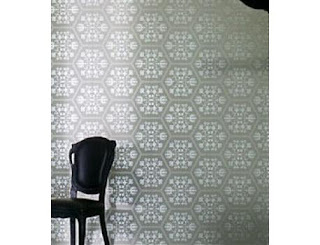 Marcel Wanders Stella wallpaper from Design Public available in white, black and a range of other colours. Smudgy and edgy, Carlu Noir from Designers Guild also comes in Vanilla. Oh my I love them all! Esp the first and last. 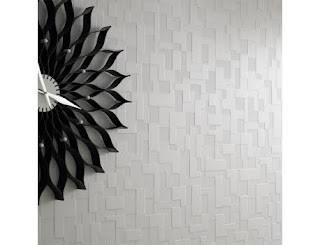 I like the white on white geometry--which will work quite well on those walls and keep the space bright. love the idea of the texture on the last one... especially that you can paint over it. i love the last, easy on the colour full on on the texture! That's a lot of good stuff to choose from. My only concern about the textured paper would be those darned cats. I worried about that in my guest bath but so far, so good. Jayne at The Kelly House had a problem (and I don't think hers was even textured) but the more texture, the more tempting. I've sent for some samples so I will paste one up and see if the cat - it will be Hermes - goes for it! 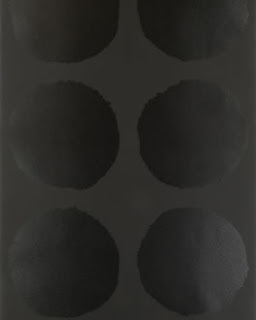 Black Flocked wallpaper would be a link/dust/pet hair magnet. Love the Curvy last one. Jenni - you are such a practical designer... but it gives me an idea - wall coverings made from dust and pet hair - since I vacuum one canister per room I could just throw it at the lining paper and save myself any further dilemma! Oh, I love the last two!!! Will the two of us ever solve our wallpaper dilemma? I love the black and white design. It is so relaxing.